CW keys cost too much, or do they? I read various forums and blogs for the same reason you might be reading this one. I'm always interested in learning more or trying to answer someone's question in a forum, etc. etc. "CW straight key prices are so obscenely inflated that I lost interest in learning CW..."
Morse Express offers a good selection of keys and I've had good experience purchasing from them. At the time of this writing they offer an AMECO straight key for $12.50, the Hi-Mound model 705 for $50 and a Nye Viking Speed-X for $85. Prices can certainly go up from there... A Begali Spark (available from Begali) is approximately $150 and more custom keys and materials can go up and up and up. There may be less expensive new straight keys than the AMECO $12.50 model but let's start there. The 99 cent "Skillman 'jr' Speed Key" appears to be equivalent to the AMECO AM-K1 advertised at MorseX site. 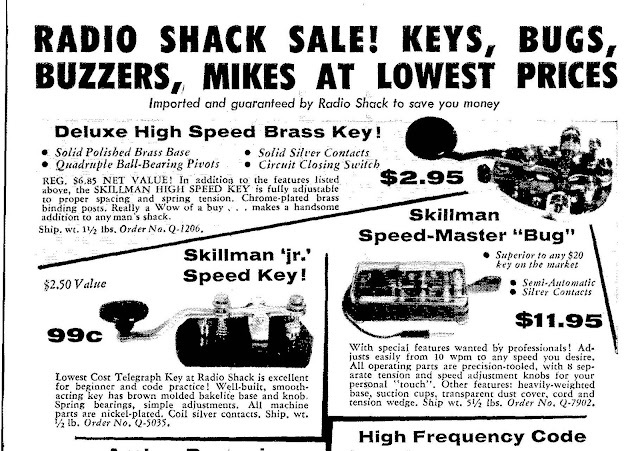 What is 99c in today's money... about $8.50 So yes by that measure the absolute cheapest key you could buy from Radio shack in 1958 would cost only 75% of what you'd pay today. What about the next model up, the "Deluxe High Speed Brass Key" is probably equivalent to a Nye Viking Speed-X. So $2.95 versus $85... Hmmm inflation says the Nye Viking should cost $25 based on that comparison. Maybe the Speed-X is better made than the 1958 Radio Shack "Deluxe High Speed Brass Key" but probably not 3-4 times better. So it would seem straight key prices are significantly higher now than in the 1950s Why is that? So according to this 1958 FCC Report there were 180,738 licensed amateur radio operators in the USA in 1958. ALL of those operators were required to both learn morse code and were originally restricted to only operate CW until a license upgrade occurred. Even after that I'd argue (and I'd like to hear from operators from that era) that CW continued to be a far more common mode of communication for hams than phone modes at the time. So guess what? All these operators were purchasing morse code keys. I don't think the electronic keyer had come into common use at the time so they would be buying straight keys or bugs of some type (not discounting cooties but hey let's admit using a cootie takes a special kind of strange). Morse code is not required to obtain a FCC amateur radio license. There are ~744000 licensed hams but ~373000 are Technician class; so although they might be exercising CW in their limited band portions I think we'd all agree that's highly unlikely. So that leaves us with 371,000 operators that could be operating CW. Seems like a big number. My personal anecdotal experience from visiting local Amateur radio clubs tells me that less than 1 in 20 licenced operators regularly use CW and of those the majority use electronic keyers with paddles or operate with a keyboard, rather than using a mechanical key. The SKCC is a club/association for straight key and mechanical key operators. From what I can tell it is the most popular CW related club at present. As of this writing it has 17385 members. Since all these members are using mechanical keys that's a good gauge of active straight key operators at present. Ok making a semi-sketchy educated guess out of this combination of my assumption filled math moderated by anecdotal experience and one actual real number; I'm guessing there are 18,000 active mechanical key operators at present in 2017 compared to 180,738 in 1958 (not taking into account other potential buyers straight keys outside of amateur radio). There is likely less than 10% of the 1958 market for straight keys now. Add to this that's it's likely easier to obtain a used key today from an auction or ham swap sites that further dilutes sales potential of new straight keys. So with greater than 90% market erosion we look back up at the cost of manufacturing chart and see why straight keys cost so much now compared to when you were an aspiring novice back in the 1950s. What is a CW key worth? Of every item in your shack, what are you going to actually touch as much as your CW key? You will physically interact more with you CW key than any piece of equipment you own. It's kinda like comfortable shoes. Sure you can buy a pair of $10 flip flops or you could have $3,000 custom made Italian shoes. Somewhere in between lies something that's both functional, comfortable and durable. The same is true for CW keys. You could buy the $12.50 AMECO plastic key or a $540 Begali sideswiper. Both work, but what you can be happy with likely lies somewhere in-between. Folks will happily spend big bucks for a ham radio microphone to achieve that "full fidelity sound" (in ahem 2.8kHz bandwidth) but they balk at spending over $100 for a CW key. Seems to me that keys aren't getting the love they deserve. So before you decide that you won't learn CW until the price of Morse Code Straight Keys comes down from today's obscene prices, consider what it is you're actually buying and why they just might cost more today than when you were a lad and all automobiles had to be hand cranked. It's also worth mentioning that a good key can more than last a lifetime. I've gone through a dozen cars in the 30 years that I've owned my Vibroplex paddles, an my J-38 is WWII vintage. Very true Steve, my keys will likely outlast me as well as the next couple of operators who may use them. FB post Richard. Bargains are there to be found. I recently snagged a Soviet pump-style NOS straight key on eBay for about 25 bux. I like it much better than my J-38 (must be my Swedish blood, hi). Also, upgraded from Bencher paddles to a wonderful Begali Expedition. Now that's a bargain for a great paddle! BTW, loved your appearance on the DitDit Podcast ( https://www.ditdit.fm/shows/episode-9-0-to-20-wpm-in-nine-months ). Very enjoyable, and lots of tips too. Glad you enjoyed the podcast Paul, Bruce (of ditdit.fm fame) keeps it flowing and edited out my rambling... I haven't had the chance to try one of those Soviet pump style keys but I'll keep an auction eye peeled for a bargain. I haven't pulled the trigger on a Begali yet. I'd really like to try a Begali bug but I need to win the lottery first. Hope to hear you on-air. Don't just look at keys from the amateur side of the house, the military used a ton of them, I went through Radioman A school in 65-66, we had about 80 people in the class, every day we used the keys as part of the training, add to that every radio room had a least one key, be it aircraft, ship or shore station. They were the J-38 keys and they were all beat up, miss adjusted, you name it but we had to learn to make do with what we had, the thing we had to learn first was how to properly send code. When I went for Radioman 2nd class the requirement was sending and receiving, The first thing the RMC had us do was the sending test, 20 wpm, we were young, thought we were real hot shots, the receiving portion of the test was copying what we sent, Chief taped us!, what an eye opener, his comment was "if you can't copy your own fist how do you expect anyone else to?" If you can't send properly with a cheap J-38 key, or something like it, what makes anyone thing that a $500 key will do any better? I've never been able to properly set up my Vibroplex bug but I saw their display at a Ham Fest and every key was perfectly set up, myself I use a Vibroplex Iambic paddle with a WinKeyer USB, I do a lot of contesting and N!MM has the interface for it, at 70 years old the arthritis in my hands and arms is starting to get worse. I also have 2 Brown Brothers paddles, 1 I bought and the other was given to me, I have them put aside, I doubt I'll use them again but they have memories, same with the straight key I use, it's a Ham Key, heavy metal base and the rest is solid heavy plastic, I won it as a door prize from a club that is mostly VHF repeaters, when they showed it for the drawing everyone got a big laugh, when I won it the guy doing the drawing commented "it figures, a CW operator won it", I also have a brand new WWII J-38 key, it's part of a wire communications kit. One Field Day I was using my Brown Brothers paddles, guy shows up and starts playing with the adjustments, he said "I'm a paddle slapper", yeah and I said "they don't make those anymore and I can't get parts", this led me to find http://www.americanmorse.com/ I built the KK2B, nice and solid, under $100 and I don't worry about someone breaking it, if you look they have a nice assortment of kits you could build. Sometimes I think if you did a so called blind test, more than half the operators couldn't tell the difference between a $500 key and an old J-38 that is properly adjusted. Very true John. GL with the bug setup, since you like to slap your paddles the bug seems like you might really like it if you get it setup the way you want. I need to write an article on bug setup. I play with mine all the time and have found that (for me) spacing my fingers as if I'm using a cootie, helps with the timing. I likely have poor technique but it works for me. Great post. The high price of keys shouldn't prevent oneself from enjoying CW. After all, it's easy to build one. Some time ago I made an ugly-looking straight key with just a twisted piece of rigid wire and I actually enjoy operating it much more than the straight keys I bought off E-bay. My preference still goes to the Vibroplex bug, but that's much harder to build. Francois, yep straight keys can come in all shapes and sizes. I've tried one made from a clothespin but I think my wife took it back to clip the chip bag shut. Ps: see you here in Dayton next year.